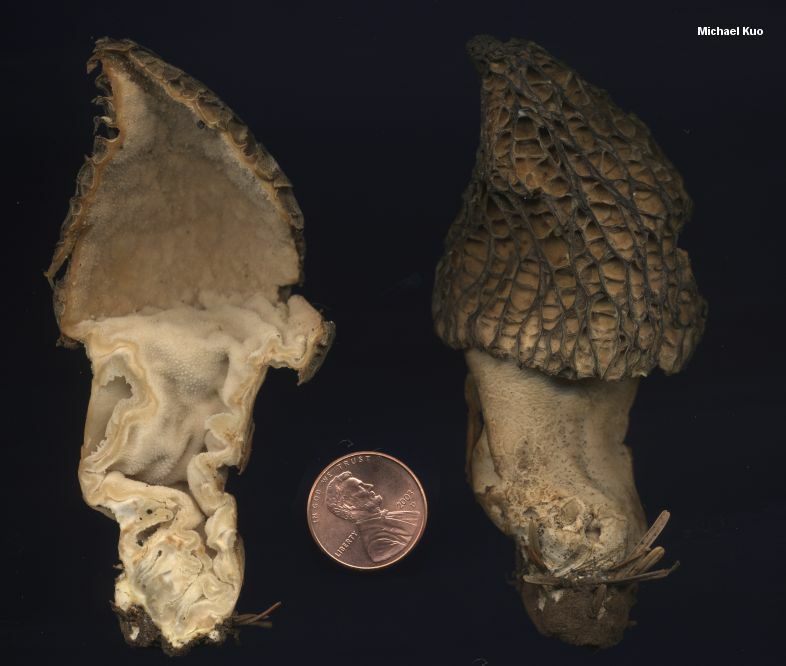 Morchella capitata is one of three frustratingly similar morel species that appear in western North America's conifer burn sites (a fourth burn-site species, Morchella tomentosa, has densely fuzzy surfaces and is easily separated). Unlike the apparently inseparable Morchella sextelata and Morchella septimelata, however, Morchella capitata appears to have some physical features separating it: its stem is often chambered and layered internally, and the elements on its sterile ridges, under the microscope, are "capitate," which means they have roundish swollen ends. That's my theory, anyway, based on examination of seven collections, six of which were fresh. Among those collections, the chambered stems and capitate ridge elements were the only features I found that consistently applied to Morchella capitata and not consistently to other species. 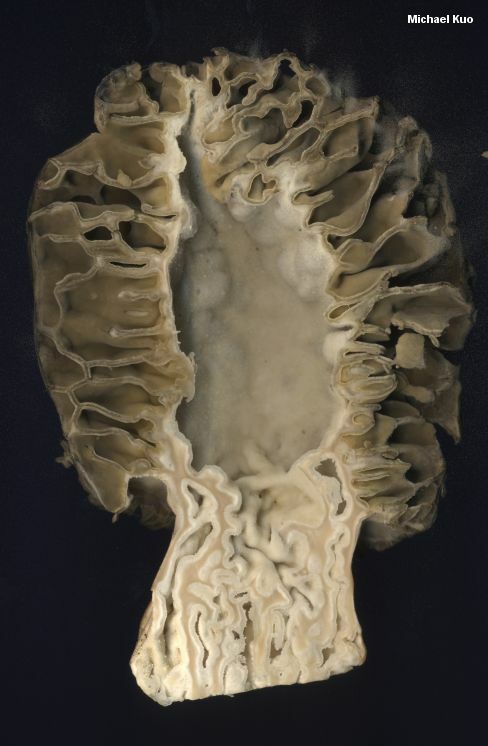 Although just about any morel can develop a thickened, chambered stem if it remains unpicked in favorable growing conditions, the stems of the Morchella capitata specimens I studied were all chambered, even in young specimens--and while sterile ridge elements are occasionally capitate on several other morel species, the sterile ridges of the Morchella capitata collections I examined were consistently and prominently so. 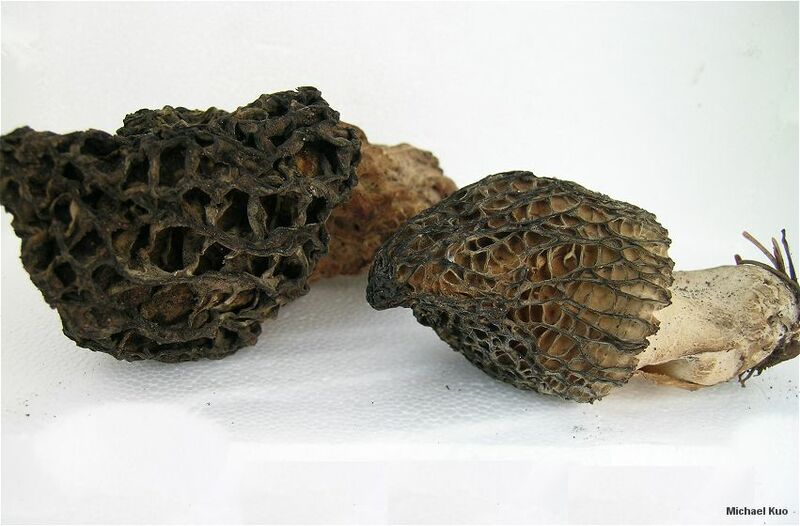 Two of the collections I looked at were olive green, and would have qualified as what commercial morel pickers sometimes call "pickles" or "greenies"--but the other collections were not green, and specimens of Morchella sextelata and Morchella septimelata are frequently green, too; color appears not to be a reliable way to separate the burn-site morels of our continent. 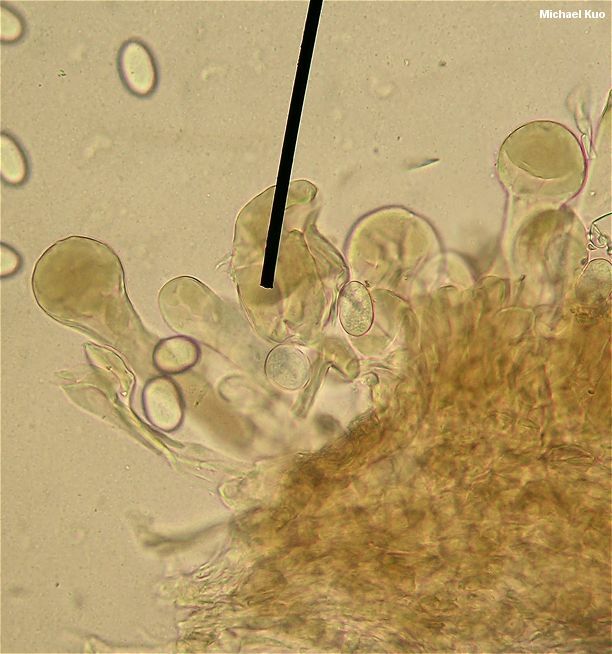 Ecology: Possibly saprobic and mycorrhizal at different points in its life cycle; appearing in lightly burned spruce and fir forests in Oregon, and possibly in conifer burn sites throughout western North America, in the spring or summer following the fire. Cap: 4-8 cm tall and 2.5-8 cm wide; conical or nearly so, but occasionally egg-shaped or nearly round; pitted and ridged, with the pits primarily arranged vertically by maturity; when young with bald or finely velvety, flattened, olive green or brownish ridges and pits; when mature with flattened to sharpened or eroded, dark brown to black ridges and brownish to tan pits; attached to the stem with a small groove (1-7 mm deep); hollow. Stem: 2.5-5 cm high and 2-5 cm wide; equal, or sometimes becoming somewhat swollen at the base; whitish to pale brownish; bald or finely mealy with granules; chambered and layered inside (often densely so), even when young. 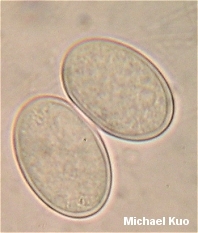 Microscopic Features: Spores 18-25 x 12-17(-19) µ; smooth; elliptical; without oil droplets; contents homogeneous. Asci 8-spored. 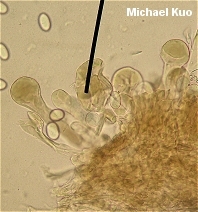 Paraphyses cylindric with clavate, subfusiform, or merely rounded apices; septate; hyaline to brownish in KOH. Elements on sterile ridges 75-200 x 10-35 µ; septate; brown in KOH; terminal cell usually subcapitate, capitate, or dramatically capitate (strongly swollen and subglobose) but occasionally clavate or merely cylindrical with a rounded apex. SPECIMENS EXAMINED: Herb. F. 08070401, 08070402, 08070405, 08070406 (holotype), 08070407, 08070408. Herb. OSC 139278. Kuo, M. (2012, October). 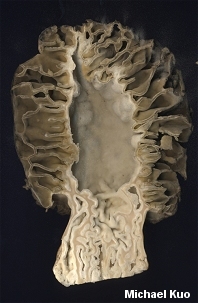 Morchella capitata. 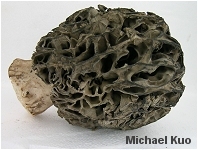 Retrieved from the MushroomExpert.Com Web site: http://www.mushroomexpert.com/morchella_capitata.html.